Police officers stand guard outside a supermarket in Caracas, Venezuela, Jan. 10, 2018. Looters have struck markets in other parts of the country. Talks to ease Venezuela's dire political and economic straits are scheduled to resume Thursday, even as severe food shortages fuel looting and the president and parliament spar anew over access to humanitarian aid. 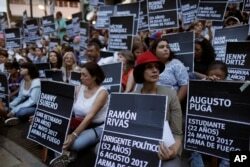 "We are on the verge of a social explosion," Jorge Millan, an opposition lawmaker in the National Assembly, said Tuesday in arguing for "palliatives" to the protracted crisis that already sparked four months of near-daily protests last year. The legislature agreed to push President Nicolas Maduro's administration to allow international deliveries of food and medical supplies to ease suffering in the country of 30 million. Maduro condemned the legislature's move as an attempt to foment foreign intervention. "It's the same people who want to destroy this country, [who] do not want this country to prosper," he said. "I call upon the Venezuelan people to actively repudiate the National Assembly." Earlier this week, looters emptied shelves in five stores in Venezuela's southeastern Ciudad Guayana, Reuters news agency reported Tuesday. Workers repair the fence of a looted supermarket in Puerto Ordaz, Venezuela, Jan. 9, 2018. To address Venezuelans' desperation, representatives of Maduro's administration and the opposition coalition Democratic Unity Committee (MUD) plan to meet Thursday in the Dominican Republic for two days of renewed talks. On Friday, they're to be joined by international observers: Danilo Medina, the Dominican Republic's president, as well as officials from Bolivia, Chile, Mexico and Nicaragua. The ruling Social Party's team seeks international recognition of the National Constituent Assembly as well as an end to international economic sanctions that have reduced the debt-ridden country's access to foreign currency. The United States considers the Constituent Assembly – an all-powerful superbody packed with Maduro supporters – to be fraudulently chosen and a threat to the democratically elected National Assembly. Last Friday, the U.S. Treasury announced sanctions against four more former or current Venezuelan officials. Opposition representatives – led by the National Assembly's outgoing president, Julio Borges – want the administration to respect that legislature, permit foreign humanitarian aid, release political prisoners and commit to democratic elections. FILE - Anti-government demonstrators hold the names of people killed during months of deadly protests, gathering at a Caracas park Aug. 30, 2017. More than 120 people died in the protests. Maduro, who faces re-election in December, has accused Borges of maligning his administration and exacerbating Venezuelans' hardships. "Borges is abroad conspiring so that nobody sells a single product to Venezuela, a ship does not arrive and neither do the necessary imports," the president said in a televised address December 29. Simon Calzadilla, an opposition lawmaker expected this week at the talks in Santo Domingo, said the MUD was negotiating in good faith. "We are waiting for an agreement to be reached for the good of the country, to get out of this crisis," he said in a phone interview with VOA. "… I hope the government understands that its model has failed, that institutions must be restored through a comprehensive agreement that gives good news to all." Calzadilla would not comment on whether the Maduro administration's December 24 release of dozens of prisoners was in any way linked to negotiations earlier that month. "We have agreed to maintain prudence," he said. FILE – A child holds a bilingual leaflet calling for the U.S. repeal of sanctions against Venezuela, in Caracas, April 10, 2015. Previous rounds of negotiations have left deep fissures in Venezuela's opposition. The talks are opposed by political leaders such as Antonio Ledezma, the former Caracas mayor who in November fled house arrest for exile in Spain. "We hope that no one will recognize the National Constituent Assembly or request the lifting of sanctions against individuals accused of corruption and violating human rights," he said on social media last month. Richard Blanco, a National Assembly lawmaker and head of the opposition group July 16 Fraction, also said last month that he had low expectations for the talks. "There will be no results of any kind here," he predicted. "Nothing will happen at all." Juan Andres Mejia, a National Assembly lawmaker and a founder of the opposition party Popular Will, on Wednesday threatened more protests if the talks make little progress – particularly in opening access to aid. "Venezuelans cannot keep waiting while they watch their children die," Mejia said. "… If this negotiation fails, know that this party will be on the street defending the rights of people, fighting for the constitution, fighting for food." Hundreds of children have died from severe malnutrition since 2014, The New York Times reported in December in an investigation drawing on interviews with doctors in 21 Venezuelan public hospitals. Jorge Rodriguez, the Venezuelan government's communications minister and its spokesman in the talks, reacted to Meji's comments by questioning the opposition's openness to negotiation. He also threatened a harsh response to protests. "Jump in the street once and on the street we wait for you," Rodriguez warned. "Then do not say they are political prisoners. They are violent people who promote looting." This report originated with VOA's Spanish service.